A lot of companies are on social media "just because" - but there are so many business opportunities to uncover if you know where to look. 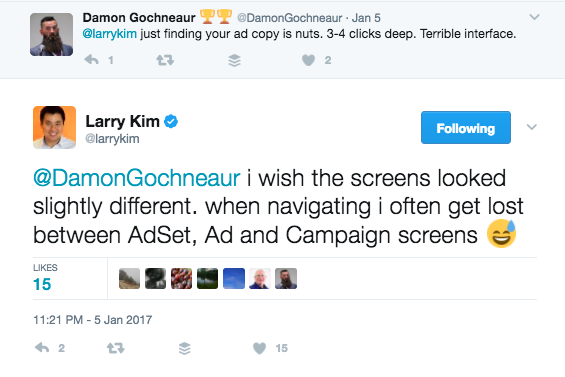 In this post, I'm going to use a tweet from one of my favorite influencers, Larry Kim, to illustrate all the marketing, sales, and PR possibilities we can uncover if we just keep an eye on online discussions in our industry. Ready? Grab a coffee and start listenin'. Apparently, he's not alone in that opinion - the tweet got liked by almost a hundred people and sparked heated discussions about other ad platforms. 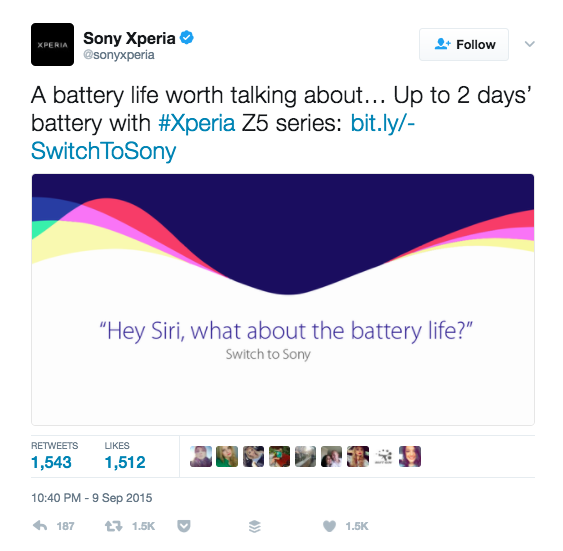 Regrettably, none of the brands mentioned stepped in and joined the conversation. We don't know if they were even listening at all, but as a marketer of a social media listening tool, I can't help but notice all these wasted opportunities to engage. 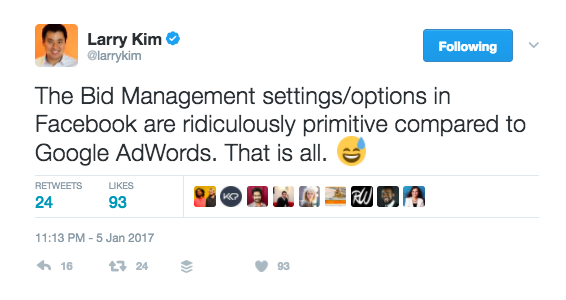 Because Larry Kim didn't @mention Facebook or Google AdWords, they may have simply missed the tweet - a problem that they wouldn't have if they were using a monitoring tool for their brands. .
Customers complain on social media because they want to be heard. They want an explanation, if not a resolution - otherwise, people would've just written their complaints in their diaries. Given that it's a direct criticism on their bid management settings, Facebook could've at least come out and said "Sorry we're so lame. We heard you and will try to do better." It might be scary to face dissatisfied customers - especially on social media where your every move is under public scrutiny - but not responding makes customers feel like you don't care. And they'll stop caring too. And nothing kills a business faster than apathy. Of course, you can't respond to negative feedback if you don't even know its happening, so the first thing you need to do is to set up alerts for your brand, so that you'll be notified of any such discussions even when people aren't tagging you. Pro tip: Set up alerts for your product name and keywords like "issues," "troubles," or "problems." If you're overwhelmed with mentions, filter them by sentiment. Focus on frustrated customers first. Saying sorry is the first step, but real improvements must follow your apology. After putting out the fire and saving face, Facebook should take a deep dive into their bid management settings or interface and actually try to resolve the issue. They can then make a tally for the most requested feature to guide their product development roadmap. Customers know what they want and need, so the more you take your customers' opinions into consideration, the higher chance of success you'll have for your product. Tracking what features your customers like about your competitors is also a great way to get ideas - so Facebook could also look into how Google AdWords is rocking people's socks off, for example, and steal a couple of tricks from them. Pro tip: Set up alerts for your product name and keywords like "if only" "I wish" or "please improve," or your product and feature names. Like "'Apple' and 'Siri'" or "'Apple' and '3D touch'." You can then do the same for your competitors. If you've paid close enough attention, you'll see that Facebook isn't the only brand mentioned here. Google AdWords, a competitor of Facebook's ad platform, is praised in this tweet. If they had set up alerts for their brand, Google could've jumped in and grabbed this perfect opportunity to gloat. First, they could thank Larry Kim for the shoutout and then retweet it to their community. Obviously, you can't beat the competition if you don't know what they're doing, so don't just monitor discussions about your own brand, but also those of your competitors. Listen to what your customers think about your competitors, and look out for golden PR opportunities you can leverage. Responding when your brand is mentioned should be an obvious given, but savvy social media marketers or sales reps should listen and hunt for opportunities to speak up, even when they aren't the focus. In this example, Facebook partners and third party ad platforms could jump in a say "we can help" Because monitoring non-direct competitors or industry leaders is not only a great way to stay on top of trends, but also to generate leads. If you're a PPC agency, for example, you could monitor discussions about people having trouble with setting up their own AdWords account, or difficulty with Google's keyword planner, and offer advice and help. That way, even if you don't score the client right away, you'll win PR points, and establish your brand on social media, which will likely mean more money in the long run. One of the reasons I picked this tweet for this case study is because Larry Kim isn't just any ordinary Twitter user. As the founder of Wordstream, and with 648K Twitter followers, Larry is a huge influencer in the B2B tech industry. His opinion carries weight. In the social media world, all tweets are equal, but some tweets are more equal than others, so it's a huge mistake for Facebook to ignore this tweet, and for Google AdWords to not leverage this influencer marketing opportunity. If you're using a monitoring tool like Mention, you'll not only be notified when someone mentions your brand, but you can also filter the mentions by their influencer score to prioritize the VIPs. And when you want to launch an influencer marketing campaign, you can easily find big guns who've already talked about you or your industry (depending on what keywords you're monitoring) and reach out to them. So by now, you should see all the opportunities you'll miss if you don't monitor social media in real time. Most companies are on social media with elaborate social media plans and posting schedules, but you can't get the most out of social media if you don't know when people are talking about you and engage with them.